The photograph above shows the building in 2010 when it is being used as the offices of David Cross & Co. solicitors. We have two photographs further down the page showing the property in the early 1900’s when it was used as ‘Williams Refreshment Rooms’. We are grateful to David Cross for allowing us to see the deeds of the property. We have supplemented the information shown in the deeds with details from the deeds from the adjoining property (no. 50), census records, rate books and electoral registers etc. In 1805 Samuel sold the two properties to Hester Hollister for £400 and she sold them to James Longman in 1821. Following his death in 1827 they were left to his children – in the case of 52 High Street this was left to Edwin Longman who sold the house to his sister, Hannah and her husband, William Bendall. We have listed below the later owners of the house, together with brief reference to any tenants known to have lived there. William Bendall – William was a tailor of Thornbury. On 20th June 1821 he was shown as a tenant of Hannah Hollister when the property (and the property next door – number 50) was sold by Hester Hollister to James Longman for £350. It was described as ‘lately rebuilt by Penduck now two dwellings, now of …(blank).. Ward and William Bendall as tenants to Hester Hollister‘. On 30th May 1828 William purchased the property from Edwin Longman for £170. Mrs Virgo – mentioned in several indentures as being the occupant of the house about 1827/8. We suspect that she is the widow of William Virgo, the schoolmaster at Attwells Free School who had died in 1823. We can’t be sure but she might be Sarah T Virgo who was buried at the Congregational Church on 21st February 1832 aged 56. Following the death of James Longman (see above) in 1827 the property was put in trust for Edwin Longman, but on 3rd June 1828 it seems to have been conveyed to William Bendall, whose wife was a daughter of James Longman and brother of Edwin. It seems that William immediately sold the property to Daniel Palser. Daniel Palser – Daniel was a tinplate worker. On 3rd June 1828 Daniel bought the property (later known as 52 High Street) from William Bendall and his wife, Hannah. It is possible that Daniel married at Holy Trinity Minories Church, East London on 22nd July 1821. His wife was Harriett Plomer. Harriett died in Thornbury on 27th February 1831 aged 40 and was buried in the Congregational Church burial ground. On 22 December 1834 Daniel got in trouble. He was one of many Thornbury tradesmen convicted for using inaccurate weights in his shop. In Daniel’s case, he was described as a ‘tinman’ and had four defective weights which were forfeited and he was fined 5/- and had to pay 8/- costs. A newspaper report in the Bristol Mercury printed on 12th April 1845 shows that Daniel had retired and was trying to sell his business of tin-pate working and braziers. The 1840 Tithe Map shows the house was owned by Daniel Palser and occupied by James Williams. Daniel appears to be living further down the High Street at the property later to become known as number 36 High Street. In the 1841 Census Daniel was described as a brazier living with Mary aged 40 who we think is Daniel’s sister. In 1851 he is living at Clapton near Ham. Daniel is described as a widowed independent minister aged 62 living with his sister, Mary aged 45 and now married to James Day, a farmer and another sister, Ann Palser aged 48. All the Palsers had been born in Wotton Under Edge. James Williams – the 1840 Tithe Map shows the premises was occupied by James Williams as a tenant of Daniel Palser. James was born about 1813, the son of Thomas Williams. The deeds of the property mention that James married Elizabeth (whose maiden name is unknown) on 1st January 1834. They had two children before the 1841 Census: George Mansell baptised on 13th January 1836 and Sarah Anne baptised on 5th June 1839. The 1841 Census shows James was a shoemaker aged 27 living with Elizabeth aged 29, Mansell aged 6 and Sarah Ann aged 2. Little George Mansell died aged 8 and was buried on 25th April 1843. At the time of the 1841 Census James appears to be sharing the house with another family, that of William Harvey. The census shows William was a druggist aged 50 living with Ann aged 50 and Sarah a dressmaker aged 24 and Harriett aged 22. None of them were born in Gloucestershire. We suspect that William was the one listed as the tenant of 53 High Street in the land tax records from 1829 to 1832. The 1851 Census shows William had moved to 34 High Street. The census shows he was born in Banwell and his Ann was aged 65 and born in Wick St Lawrence. Ann died aged 68 and was buried on 3rd August 1856. William died just a few days later and was buried on 10th August 1856 aged 66. An inquest was held into William’s death as it was suspected that he had committed suicide. The verdict however was ‘visitation of God’. The 1851 Census shows James as a master cordwainer living with Elizabeth who is shown as being born in Tytherington and their children: Emily Hester aged 8 and another George Mansell aged 7 months. Also living there were James’s widowed father Thomas a retired farmer aged 76 from Wiltshire, a servant Sarah Rodman aged 16 and two other people who appear to be boarders: James Neal a land and timber surveyor a widower aged 76 from Henbury and Ann Walker an unmarried dressmaker aged 40 from Thornbury. On 19th July 1858 James Williams bought 52 High Street from Daniel Palser for £125. At the time of the sale the deeds show that James was already occupying the property. The 1859 Rate Book shows James was the owner and occupier of the property. In the 1861 Census James is a shoemaker employing one man and he is living with Elizabeth, Emily aged 16 and George M aged 11 and a boarder Ann Walker a milliner aged 48. The 1871 Census shows James Williams, a master bootmaker employing a man aged 59 born in Thornbury living there with his wife, Elizabeth Williams aged 61 from Bristol and their daughter, Emily aged 24, and son, George Mansell Williams an apprentice bootmaker aged 20. Elizabeth died aged 71 on 20th February 1880 and was buried at the Congregational Church burial ground. The 1881 Census shows the house was occupied by James William a retired bootmaker and a widower aged 68 from Tytherington and his daughter, Emily Williams aged 35 from Thornbury. Although James carried on living in the house, on 30th June 1880 he arranged for the property to be conveyed to his son, George Mansell Williams. It was put into trust allowing James to live there for the rest of his life. Another property belonging to James, later known as 9 Pullins Green, was left to James’s daughter Emily Hester Williams. It was agreed that George and Emily would pay James an annuity of £34 18s 0d (or 14 shillings each week) and that this money should come from the rent and profits from the Pullins Green property. In 1884 James got involved in a boundary dispute with a neighbour, Caroline Parfitt, who lived next door at 54 High Street. It appears that Caroline accused James of looking into her garden from the roof of his privy and she built a wooden hoarding and raised the level of the wall to prevent James doing this. James objected that she had interrupted the free passage of light and air to the window at the rear of his premises and James’s son, George Mansell, wrote to Caroline threatening action if she didn’t remove the obstruction within 14 days. An agreement was reached in which she promised to remove the obstruction as long as James promised to not to use the roof of the privy for sitting, standing or walking to overlook into Caroline’s premises. James died on 21st November 1889 aged 76. He was buried in the Congregational Church Burial Ground. Hester Morgan – the 1890 Rate Book and the 1891 Census shows the property was occupied by Hester (or Esther) Morgan. The census shows she was a widowed refreshment house keeper aged 73 from Hill living with her brother, Henry Riddiford single aged 49 working as an assistant also born in Hill and one lodger, John Davies, a tailor aged 42 from Thornbury and a boarder Frederick Baker from Torrington in Devon. Hester was baptised on 25th December 1817 at Hill. She was the daughter of William Riddiford, a farmer and his first wife, Mary Ann. William and Mary Ann had four children before she died in 1820 aged 39. William then married Ann Ford and had nine further children, including Henry, the brother living with Hester in 1891. Hester married George Morgan, a tailor and a widower, 21st October 1843. George’s first wife, Mary, had died nine months earlier aged 33. The 1851 Census and 1861 Census records show the family living at Newton near Rockhampton. In 1871 Hester was away from home visiting her aunt Priscilla Mower nee Riddiford in Cromhall. George was now trading as a tailor at 15 High Street, next door to The Swan Hotel. George died aged 65 in 1876, but the 1877 trade directory still showed George as running the Refreshment Rooms in the High Street. The 1880 rate book shows that Hester was living at the property which later became 18 High Street. The 1881 census shows Hester living here and running a business as an ‘Eating House’ and she was still there at the time of the 1885 Rate Book. By 1890 she had moved to 52 High Street where she carried on with the refreshment room business. She is listed in the 1897 trade directory running ‘Coffee Rooms’ in the High Street. She died in 1900 aged 82. Alfred Williams – in the 1901 Census the property was occupied by Alfred Williams, a grocer’s porter aged 34, Ruth his wife aged 33 and born in Alveston, and their children: Frank a chemist’s porter aged 14 born in Alveston, Kate aged 12, Olive aged 7, Charlotte aged 4 and Reginald aged 1, and three boarders: Walter Allcock a hairdresser aged 26 from Penzance, Nelson Andrew a bootmaker aged 22 from Bradford, Wilts and Robert Stafford a coachman from Slanton by Dale, Derbyshire. Alfred was the son of Mark Williams and his wife Emma who were married in the Thornbury area in 1866. We have details of a property sale dated 21st May 1919 referring to a house in the High Street occupied by W. Symes at an annual rental of £15. The house was described as having two front sitting rooms, kitchen, back kitchen, cellar and 4 bedrooms. We believe that this house must be 52 High Street because we think that ‘W. Symes’ must refer to William George Symes, the husband of the Lois Hedgland Symes who was listed in the deeds as being the tenant in 1920. Henry Shield – Henry was a retired farmer from at Newport, near Berkeley who bought 52 High Street off George Mansell Williams on 23rd March 1920. The price was £220. At the time of the sale the house was occupied by Lois Hedgland Symes. Henry was born in Tytherington in 1838, the son of James Shield and his wife, Mary (nee Isaac). The Shields were farmers at Barbers Land Farm (sometimes called Barmers Land Farm), a large farm of over 200 acres at Tytherington. In 1876 Henry married Selina Pullin from North Nibley, and the daughter of Thomas Pullin and his wife, Eliza (nee Daniell). In 1917 when he wrote his will Henry and his wife, Selina, were living in St Mary Street, Thornbury. They are listed in the 1918 electoral register as living in Castle Street. Selina died in 1920 aged 67. Henry died on 24th May 1921 aged 82 and shortly after the property was sold by his representatives (James Thomas Shield of Flood Gates Farm near Berkeley farmer and Lawford Henry Shield of Alkington Farm near Berkeley) . Archibald Symes – on 23rd June 1921 Archibald purchased the house from the Representatives of the late Henry Shield for £255. At the time of the sale it was occupied by Archibald’s cousin, Maurice Symes who was paying an annual rent of £16 with tenant paying the rates. The house was described as containing: two front sitting rooms, kitchen, back kitchen, cellars and four bedrooms. Archibald Harold Symes was born on 25th September 1895, the son of Frank Symes, the saddler and his wife, Augusta (nee Hill). Archibald started at the National School in 1899 and after 7 years here he moved to the Grammar School on 16th October 1907. The School Governors awarded him an exemption from school fees for four years. The School records show he was expecting to be a teacher, but after school he became an apprentice to a draper, but appears to have given that up. Archie joined the Army in the early days of the War. He served in the Royal Army Medical Corps. There is a little report in the South Gloucestershire Chronicle dated 26th February 1915 which shows that Private A Symes was selected to represent the Aldershot Command at football. It said that he had played for the Thornbury Grammar School Old Boys in 1914. A week later the newspaper reported that he played well as ‘guardian’ and he had made several good saves. The lists of Thornbury servicemen sent gifts at Christmas shows Archie was a Private serving in France in both the 1916 and 1917 lists. On leaving the Army, Archibald continued the Symes tradition by opening a shop. He is shown in various trade directories as a confectioner in the High Street. In December 1919 he was in trouble with the police being caught cycling at night without a rear light. He was fined 2/6. In September quarter 1920 Archibald married Mabel Mills in Thornbury. Mabel was born on 10th December 1894, the daughter of John Mills, a groom and his wife, Susannah. In 1901 Census the Mills family were living in The Street, Alveston. Archibald and Mabel had two sons, Ronald Frank born in Thornbury in 1920 and Donald Robert born 2nd April 1930 and whose birth was registered in Bristol. Archibald continued his involvement in football. We have seen a Gazette newspaper article in 1923 which we suspect refers to Archie. It reports that ‘Mr A. Symes, the popular Thornbury District League referee, is making favourable progress towards convalescence after his recent operation’. We don’t know of any other ‘A. Symes’ who this could refer to. At the time Archibald bought 52 High Street in 1921 it was occupied by his brother, Maurice Symes, but by 1926 Archibald and Mabel were also living there. He seems to be running a confectionary shop there. He is listed as a confectioner in the High Street in the trade directories 1927 to 1935. Local people remember that the faded advertisement indicating a Symes confectioners and tobacconist shop which was painted on to the wall of the house. Archie was listed in the 1938 Thornbury electoral register, but he was missing from the special register compiled in 1939 in preparation for the war and the 1946 Thornbury electoral register. We note however from various documents in the deeds that Archibald was working as a tailor in Birmingham from as early as 1936. In November 1937 he was appointed as a postman in Birmingham. Initially he was living in a boarding house at 7 Holly Road, Edgbaston in Birmingham. We understand that Archibald and Mabel separated and Ronald went to live with his father in Birmingham, whilst Donald stayed living with his mother in Thornbury. We know little about Ronald except that he went to the Grammar School in Thornbury. However a newspaper article in April 1945 carried a photograph of Ronald Symes (shown here on the right) that described him as the eldest son of Mr and Mrs A H Symes of the High Street and said that Ronald had volunteered for H.M. Forces when he was only 18 years old. For over two years he had served in Africa and Italy as a gunner. The article said that before he joined the army he had been employed by Whiteheads Electricity Company in Birmingham. Archie died in Birmingham in 1969. Mabel and her son, Donald, carried on living at 52 High Street for the rest of their lives. In 1957 Archibald arranged for a ‘deed of gift’ passing ownership of 52 High Street to Donald. At that time, Archie was a tailor living at 376 Camden Street, Birmingham. We understand that Donald worked in a drawing office at BAC or Rolls Royce. We understand Mabel used to work for Councell’s grocery shop and later the Coop. Mabel died in 1976. Donald carried on living in the house on his own. 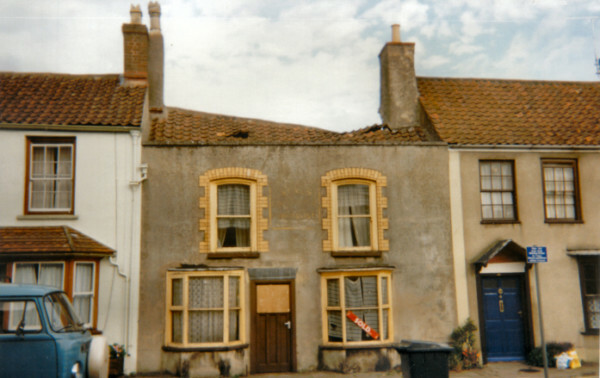 The house was allowed to get into a bad state of repair and the roof collapsed in February 1995 and Donald continued to live there in the ground floor until he died on 31st May 1995. The administration of Donald’s estate was granted to his brother, Ronald, who was still living in the Midlands. He agreed to the sale of 52 High Street to Ian and Helen Baker of 54 High Street in August 1995. In 1998 the Bakers sold the property on to David Cross, the solicitors who moved their offices there from 49 High Street.